Allegro Medical presents the Stress-Ease Support Pillow. If you’re looking for an extra firm hypoallergenic, orthopedic bed pillow to support your neck at night, the DMI Stess Ease Pillow is for you. The pillow’s outer raised lobes provide proper alignment and maximum neck support while your head is nestled in the concave center area. This orthopedic pillow is best for back or side sleepers who want extra firm support. 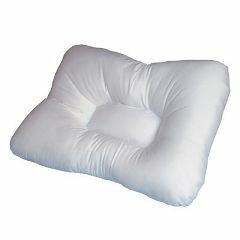 The pillow is made of hypoallergenic polyester fiberfill which holds its shape after repeated use. The cover (nonremovable) has a silky feel with a pretty flower pattern. This extra-firm orthopedic pillow is excellent for those looking for maximum neck support. Multi-size outer lobes provide proper alignment; concave center cradles the head. This is the best pillow i have ever had to sleep on. If i ever need anouther pillow i would by anouther one. I thank my husband for getting it for me. I was sure suprized when it came and it was in my name, i didn't even know about but jus love it. What a great suprize. Good neck support - side cervical lobes too hard in my opinion. I would recommend purchase for someone with neck problems. This pillow is VERY firm, which is not so great if you have spasms at night (which I do). I woke up with my neck, traps, and shoulders cramped and the nerves at my injury site (c6-7) firing like crazy. It's also too high off the bed to be comfortable. It's a great concept, just needs to be memory foam or something a bit more forgiving. Comfortable. Supportive!. holds it's shape. great price for value!. This is the best pillow I have ever used, the Veterans hopspital gave me on about 10 yrs ago, and when it wore out, they gave me a foam one, it was just not as good, I kept looking for another like this one. Finally I found this one, and I will never sleep without it. I have severe damage to my neck and it is the best thing I have found to help me sleep without waking up in severe pain. How do you clean this pillow? Is it washable?